Welcome to the UPFFL, home of some of the most unique and challenging fantasy football leagues on the web. The UPFFL spawned from the League of Champions (2002-2009) in 2010. The LOC consisted of four free total point qualifier leagues and a main Champions league. 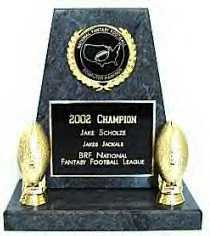 The LOC was a MFL Showcase League for eight years. We've added some head to head leagues, some pay leagues, and a pyramid system where teams move up or down depending on well they do the previous season. Once again, we've teamed up with MyFantasyLeague (MFL), home of the Internet's #1 fantasy football league management system. The UPFFL is a MFL Showcase League with all the leagues being hosted for FREE. All pay leagues have a 100% payout. The UPFFL consists of six, twelve team leagues all competing in a tiered 'Pyramid' system for the Ultimate Championship. The three tiers are the Semi-Pro, Pro, and Champions Tier. The goal is to do well enough in your leagues and move up the pyramid. There is no league more competitive than the UPFFL. The Ultimate Champion is truly the "Best of the Best." Signups for the 2014 UPFFL Leagues are now underway!